conducted by high ministers of the Healing Church. Drinking a Blue Elixir will render your character partially transparent for 30 seconds. During this time, it is harder for most enemies to see you. What this means is that you can get closer to them before they notice you and attack. Note that this only applies to your visual presence; the enemy can still hear you! If you run, fight, or do anything that makes a lot of sound, the enemy can still find you. Blue Elixirs are very powerful against ranged enemies; they're usually far enough away that they can't hear you, so using an elixir will allow you to cover dangerous open ground quickly and sneak up on them. Huntsmen using rifles and Lost Giant Children are two examples. They also work against Wandering Nightmares, which is fantastic since they tend to run away as soon as they see you. 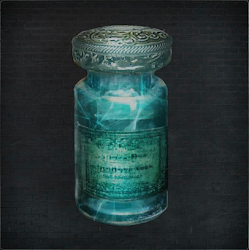 Nightmare Frontier is one area where Blue Elixirs truly shine; they'll keep you hidden from the Lost Giant Children and let you capture Bloodstone Shards from the Wandering Nightmares. You'll find four in the Forbidden Woods; it's worth saving them for Nightmare Frontier!